The irony of life. 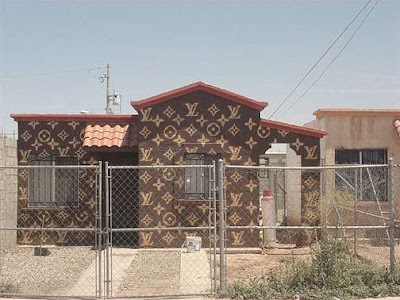 When I saw this photo of a Louis Vuitton house located in Mexicali, Mexico, I couldn't stop smiling. Still am. I wonder what the neighbors think? Perhaps one of them has a Gucci house? Seriously though, what do you think of luxury logos? Jennifer at the Peak of Chic just did a great post on them. Check it out here. that is so Ghetto fab! Back away from the computer. Now! 4 posts in 24 hours? Give us a chance to catch up. And catch our breath! These are fabulous posts!!!!!!! Janet, YES! I loved that Gucci car! I wish we had a photo of it. I'm going to paint my house Goyard. Perhaps the black & brown? WOW. That scares me lol. its great. i wonder if they do hjouse swap. I think that photo is fantastic! As for logos- it has been carried to the extreme ( is it because I cannot afford it?) However I do love my more affordable Burberry bag! I just love the fact they had the courage to pull it off! Wow. My mother in law received a Cadillac for her b.day that my father in law had upholstered in original Vuitton leather. I thought that wasw too much (specially the price tag). But dyi logo paint jobs? That's just tacky. Lol. hummmm...sigh...ok...finally figured my favorite.. i think i like the chanel truck the Best! grAte post! Uh uh uh!! Lynn, THat is TOO Funny!! Hope You're Having a Fun Weekend! Take me Back to 1939!